Sometimes, it’s hard finding quality treats for our dogs. When we are visiting friends and family, I usually like to get something fun for Reya to snack on, especially if she is showing off all of her cool tricks. As anyone with a malamute will tell you, they are very food motivated, making it perfect for training or reinforcing good behavior. Running out of treats, however, can be a major dilemma, especially if you want quality treats that can be found not only at a pet store, but somewhere omnipresent like Wal-Mart (lets face it, we all have one not that far away). Luckily, I know I can depend on a few brands to make sure Reya has treats when we need them on the go- Dingo. 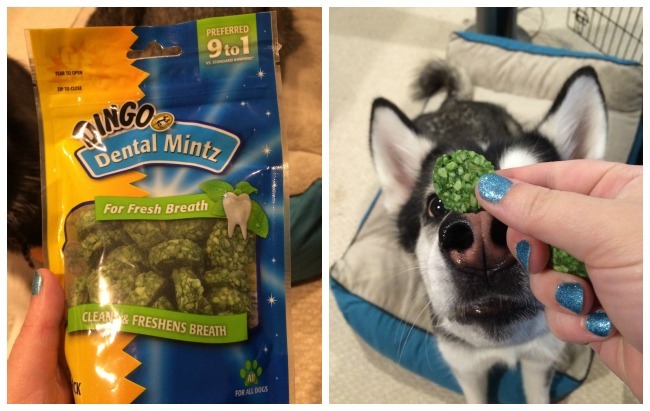 Looking for yummy treats to freshen your dog’s breath and boost their dental health? If so, we think you will love Dingo’s Dental Mintz. These dental treats help maintain your dog’s dental health with great ingredients like baking soda, chlorophyll, and parsley seed to give your dog’s mouth a good cleaning, while also giving them a tasty treat made from real chicken. Dogs of all sizes seem to love these bite sized treats. Our Reya seems to like these disk size treats and they do a great job getting rid of ‘doggy breath’. Her humans especially love these treats since they are healthy and perfect for some impromptu training with their convenient size. Based on our own experience, we are happy to give Dingo’s Dental Treats an A rating! 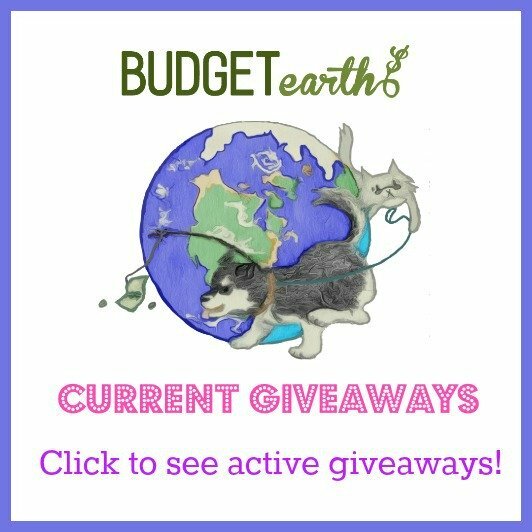 Trying to find a healthy treat to pamper your favorite dog? If so, we think you will love Dingo’s Market Cuts Chicken and Sweet Potato Treats. These yummy dog treats are made in the USA and are made using real slices of sweet potato, wrapped in premium chicken jerky. Best of all, they contain no artificial flavors, colors, or chicken by products, guaranteeing your dog is getting an amazing treat at a price anyone can afford. 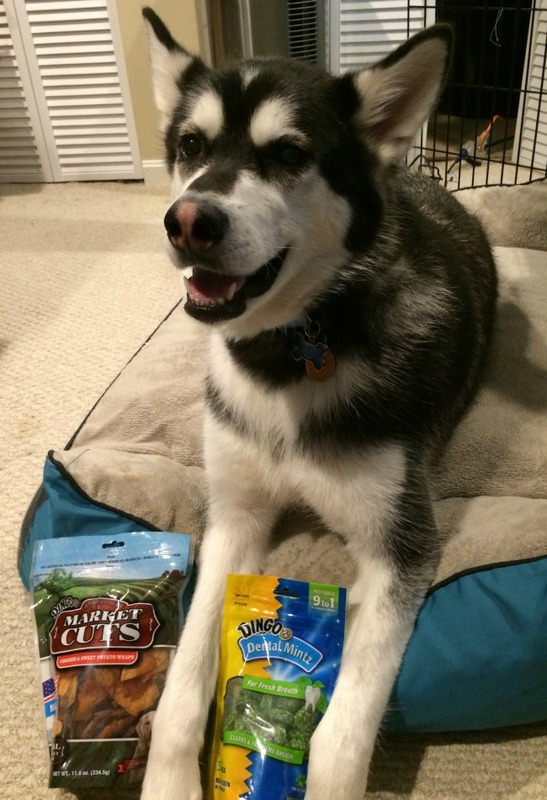 As some of you know from our previous Master Cuts review, Reya is a big fan of their chicken jerky. 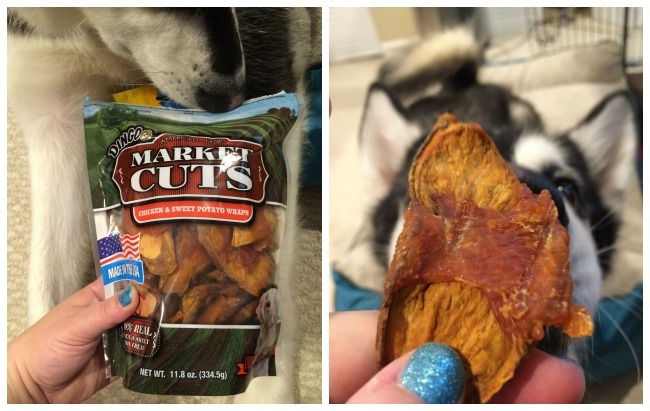 By putting together their jerky and sweet potato treats though, we ended up with a match made in heaven! She goes crazy for these treats and is constantly begging for more. Based on our own experience, we are delighted to give the Master Cuts Chicken & Sweet Potato treats an A rating. Want to try these great treats for yourself? You can find Dingo treats at a store near you using their Store locator! Don’t forget though that the Dingo Market Fresh treats are sold exclusively at Wal-Mart! Want to learn more about Dingo? Check them out on social media! I love Reya reviews!! She seems to really like this job. I have seen these treats, but never really paid attention. Thinking I will try a bag or two and see how my 3 like them. Thanks!! My dogs love Dingo brand….big time. We have a cabinet full of Dingo treats. I have tried it for my dog but cannot find it in the stores anymore. I’ve heard of Dingo but wasn’t familiar with the different types of dog treats they had; it’s good to know they’re made of all natural ingredients. I’m glad Reya likes them! I never heard or seen these. After ready your review I will look for them. They sound like a very good treat for my dog. Thank you for including some of the ingrediants. I am very scared to try new brands. These sound great though.